anguish, and that becomes the most prominent topic the film addresses. Frs. Garupe and Rodriguez, the main characters in the film, are full of youthful idealism and a burning faith. They traveled to Japan, intending to bring Christ to the island, as well as to discover what happened to their teacher and mentor, Fr. Ferreira. The Church in Macao, the closest Portuguese colony, had received word that he had apostatized, but the two young priests refused to believe it. They willingly accepted the prospect of martyrdom should God require it, entering Japan secretly, aware that if captured, they would face certain torture and execution. They embraced this possibility, expecting that their suffering martyrdom and death would gloriously imitate Christ’s suffering. The young Jesuits’ guide in Japan, Kichijiro, is a former Christian who forsook his faith rather than face death at the hands of the authorities. He witnessed his whole family burned alive because they refused to step on a fumi-e. This was a small devotional carving of Jesus or the Virgin Mary. The Japanese authorities used the fumi-e as a means to force the Christians publicly to reject Christianity by profaning it. Kichijiro is a drunk who betrays the priests many times. The film compares him to Judas, and his servile obsequious manner toward the priests makes the audience hate him, as do the two priests. As the film unfolds, however, we begin to care for him. It seems unfair that God does not take into account his weakness. However, nothing is as simple as it seems. Kichijiro gradually becomes a sympathetic, if tragic, figure. Bemoaning his weakness, he asks the priests repeatedly for forgiveness and absolution. Although Judas in some ways, it turns out that he is the one who stays with Rodriguez to the end, and it is Kichijiro who constantly reminds the young priest of the responsibilities of his vocation. The Japanese Christians, all peasants, had maintained their faith after all the earlier priests had either left, apostatized, or been executed. The community held secret prayer meetings and devotions, while outwardly claiming to be Buddhists. Without priests though, they lacked the sacraments. When Garupe and Rodriguez arrived, it was as if God had returned to the people. The priests baptized infants and celebrated the Eucharist with the community. All the while, the priests remained huddled in a remote mountain hut, forced to stay in hiding during the day. The Christians came to them by night, bringing them food. The priests learned about a malevolent Inquisitor who devised loathsome tortures in order to force believers to repudiate their faith. For instance, he held believers suspended upside down over a pit of offal and excrement, and kept them that way for days. He tied people to posts planted by the shoreline where they endured days of exposure, pummeled by waves at rising tides, before they died of exhaustion. One individual, just before he died this way, sang a hymn, which the villagers all heard. These scenes portray as noble and courageous a martyrdom as in any of the old stories. The government had heard rumors of priests in the territory and made arrests in order to flush them out. On one such occasion, the priests crouched behind undergrowth, and could do nothing when soldiers took members of their congregation as hostages. Knowing these congregants would be tortured when they arrived in Nagasaki, the two priests felt helpless, ineffective, and cowardly. After a while, Rodriguez and Garupe determine to travel separately to other villages to minister to the Christians there. From this point, the narrative focuses on Fr. Rodriguez, and we see the rest of the film from his perspective. He is captured and confronts the Inquisitor, who seems friendly and solicitous. This old samurai expresses his concern for Rodriguez’ welfare, and is regretful that the Christian prisoners should have to suffer so. He is genuinely interested to engage the captured priest in an intellectual and theological dialogue. Rodriguez is eager for this debate. He came to Japan for this. The Inquisitor and his translator explain that the government formerly had executed the priests as a means to discourage Japanese Christians. Then they realized that it was much more effective to keep the priests alive and to force them to renounce their Christianity. The Japanese government therefore devised an ingenious and horrifying way to accomplish this; it would torture and kill the Christian peasants, and would only stop if the priests would consent to profane the fumi-e. The Inquisitor makes Rodriguez the same offer. This puts Rodriguez in an impossible dilemma. If he maintains his faith as the Church taught, his congregation will suffer and die. He saves them from this only if he repudiates his own beliefs. “It is just a formality,” the Inquisitor tells him. In their debate, the Inquisitor casts Rodriguez’ devotion to martyrdom in a negative light. He mocks the priest’s appetite for glory. He frames their devotion to Japan as something selfish and self-serving, and perhaps it was. As a result, Rodriguez encourages the other Christians to apostatize, and many do. However, that does not save them. Their suffering will only end if Rodriguez commits blasphemy. He hears their screams as he sits in his cage, in an agony of indecision and doubt. The priests are suffering but, by any measure, the peasant Christians are suffering more. The priests suffer because they cannot relieve the pain of the peasants, and maintain their idealistic, unrealistic faith at the same time. In contrast, the Japanese Christians are focused and faithful. The informal leader of the community willingly gives his life for the church. A peasant woman arrested at the same time as Father Rodriguez looks to the padre for comfort and the assurance of paradise. The film reaches climax when the Inquisitor brings Fr. Ferreira for an audience with Rodriguez. Ferreira had indeed apostatized as they had heard in Macao. He was now married with children, and had taken a Japanese name. He spent his days in a Buddhist temple translating technical European documents into Japanese. “I’m finally doing this country some good,” he says. He is expected to convince Rodriguez to give up his faith and forsake his mission to Japan. Ferreira makes a subtle argument, which builds upon the Inquisitor’s earlier position. What was true in Portugal and Europe, he says, does not work in the very different Japanese culture. Japan is a swamp, he says, and the tree of Christianity that might flourish in Europe will suffer root rot in Japanese soil, and will ultimately wither and die. It is futile, he says, to bring the faith of Christianity to Japan. Rodriguez counters the argument by insisting that if Christianity is a universal truth, then it must be true everywhere. However, there is a problem with Ferreira’s argument, and I suspect that neither Scorcese (who co-wrote the screenplay) nor Endo agree with the Inquisitor and Ferreira. Endo, the book’s author, was himself a Christian. Christianity, before the persecution, had gained tens of thousands of adherents in the Nagasaki region of Japan. Even during the persecution, these communities had maintained a vital faith. They had not withered, in spite of the government’s strenuous efforts. One begins to wonder about the faith of the two priests. How solid is it? The positive statements made in narration by Rodriguez throughout the film ring false and shallow. In his suffering, he comforts himself by assuring himself how Christlike he has become, and how his life in so many ways imitates the passion of Christ in the Gospels. However, that comforting image clashes with the prospect that rather than dying for the Japanese (which he is determined to do), the Japanese are dying for him. This makes his sacrifice and commitment untenable. He cannot maintain his Christlike self-image when his compassion tells him that he should do anything and everything to preserve the lives of the peasant Christians who are being tortured and killed on his behalf. It is only at the end, when he steps on the fumi-e in response to an internal voice, which is the voice of Christ, that, in a paradox that I cannot yet explain, he becomes most Christlike. The film ends differently than the book. Endo portrays Rodriguez having apostatized and forced to marry a Japanese woman and assume responsibility for her children. After years of service and obedience to the Japanese authorities, he receives a Buddhist funeral. In the film, his wife, before his cremation, places in his hands a tiny cross. It was an object saved from one of the executed Christians earlier in the film. It injects a note of hope that is not present in the novel. 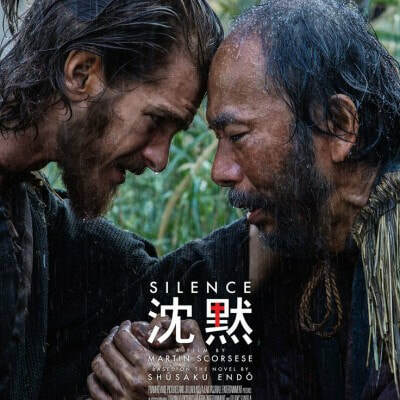 Silence is a powerful film that raises these questions without providing answers. No one voice, one position, prevails within the narrative. The priests die or apostatize. Their courage becomes cowardice, and their devotion selfish ambition. The Inquisitor, though civilized and compassionate, commits atrocities without flinching. He breaks people’s bodies and their souls. The Christian peasants are tortured or killed. Scorcese, by showing the cross in Rodriguez’ hand, declares that something good remains. The narrative itself questions this. One finds corruption in the priests, the Church, the Japanese authorities—enough corruption for all. All their faults are concentrated in the single peasant, Kichijiro. And he becomes the most stable and compassionate presence in the life of Rodriguez, and in the film.